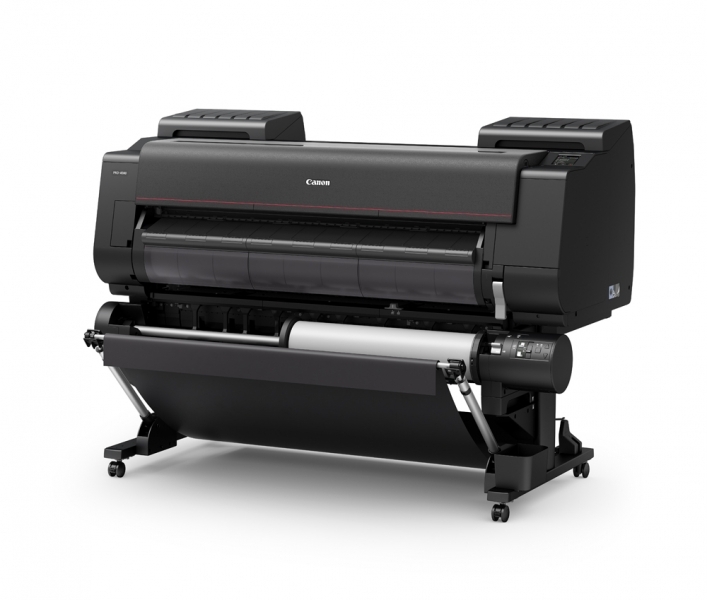 The Canon 44-inch imagePROGRAF PRO-4000 Printer with Multifunction Roll System is designed to exceed expectations for image quality and color consistency in a large format printer. The use of new a 1.28-inch wide 12-channel integrated compact print head, LUCIA PRO ink set plus Chroma Optimizer, a high-precision mechanical platform and the L-COA PRO high-speed image processing engine achieves a balance between exceptional print quality and speed. Multifunction Roll System INCLUDED The Multifunction Roll System is a versatile media handling solution system that enables either a second roll of media to be loaded on the printer, or the unit can be configured as a bi-directional media Take-up unit. Bi-Directional Rewinding: The Multifunction Roll System may also be configured by the operator as a take-up unit to rewind longer printouts. The user can choose to rewind media with the printed surface on the outside or the inside of the roll, thereby supporting “bi-directional rewinding”. LUCIA PRO Ink Set The new LUCIA PRO ink set adopts newly formulated 11-color pigment inks and a Chroma Optimizer. Designed specifically to meet the demands of even the most critical photographer, the LUCIA PRO ink formulation includes microencapsulated colorants that enable smooth gradients, an expanded color gamut, and deeper color expression. PF-10 Print Head The PF-10, a 1.28”-wide print head with 18,432 nozzles equipped with anti-clogging FINE technology, generates fast print speeds while reducing the possibility of clogging. Ink ejection conditions are precisely checked by 27 sensors, and if a clog is detected, another nozzle will automatically provide back-up. L-COA PRO High-Speed Image Processing Engine The imagePROGRAF printers are powered by the L-COA PRO high-speed image processing engine. With three new processing chips, this high-precision control engine performs the processing of massive image data, and controls the optimal ink layout that produces high resolution prints. Print Studio Pro Software The large 3.5" color LCD touch panel makes it easy to view printer information as well as perform simple operations. High Capacity Ink Tanks Available in 160ml, 330ml, and 700ml ink tanks, you have the flexibility to purchase ink based on your printing needs. 700ml photo black ink tanks can be purchased for those often printing nightscapes and 160ml magenta ink tanks for the occasional sunset image, giving you the power to purchase ink based on the color frequency at which you print. Sub-Ink Tank System The Sub-Ink Tank System allows all of the available ink in a tank to be used before having to replace it, helping eliminate any wasted ink. The empty tanks can also be replaced on-the-fly without stopping the printer. This is extremely useful during your long print jobs. Media Configuration Tool Recognizing the expanding array of media options for large format printers and to further improve the versatility of these new imagePROGRAF models, Canon has developed a Media Configuration Tool, which allows customers to not only utilize Canon-branded media, but provides the ability to make adjustments to printer settings to enhance the precision and quality of output achieved with third party media. Tip: Has your Canon imagePrograf Printer Plug-In and Print Studio Pro Plug-In disappeared after Adobe updated Photoshop via the Creative Cloud? Don’t worry, Adobe has not deleted your plug in. It is still in the old Plug Ins folder for your previous version of Adobe Photoshop. Just drag it from the old Plug-Ins folder to the new one. You can also download the installer again and reinstall it in to your new Plug-Ins Folder. Still not working? You can reach out to Canon Tech Support here.